Significance: Tiruvannamalai the home of Annamalayaar or Arunachaleswarar (Shiva worshipped as a Shiva Lingam) and Unnamulaiyaal (Apitakuchambaal - Parvati), is one of the largest temples in India. It occupies a special place in the Saivite realm and is regarded as one of the Pancha Bhoota Stalams (one of the five grand temples associated with the five basic elements) – associated with the element Fire, the other four being Tiruvanaikkaval (Water), Chidambaram (Space), Kanchipuram (Earth) and Sri Kalahasti (Wind) respectively. Shiva is said to have manifested himself in the form of a massive column of fire, whose crown and feet, Bhramma and Vishnu attempted in vain to reach. A celebration of this manifestation is seen today in the age old traditions observed in the Shivaratri and the Kartikai Deepam Utsavams held here. There is an air of deep mysticism around the temple, the hill and its environs and the town itself has been known for its long association with Yogis, Siddhas, the well known spiritual savant Ramana Maharishi and several others. The origin of this temple dates way back in time, although much of the temple structure as seen today, is a result of building activity over the last one thousand years. Seventh century Tamil poetry glorifies this temple. All of the four Saivite Saints Appar, Sambandar, Manikkavacakar and Sundarar have sung the glory of this temple and it was at this temple that Arunagirinathar began composing his immortal work Tiruppugazh. Muthuswamy Deekshitar’s kriti Arunachalanatham pays tribute to the presiding deity of Tiruvannamalai. The ancient and vast Arunachaleswarar Temple as it stands today is the result of several centuries of building, alteration and extension. A Nandi faces the main shrine in each of its five prakarams. The outermost prakaram houses the thousand pillared hall and the Shiva Ganga tank and is pierced on four sides with colossal Gopurams. . The fourth prakaram includes the Bhramma Tirtham, and its eastern gateway Vallala Gopuram holds a statue of King Ballala. The third prakaram which dates back to the 12th century AD has several Linga Shrines, and the Kili Gopura Entrance. In the East side of the prakaram stands the Flag Staff while the Northern side is home to the massive shrine of Unnamulai Amman. The 3rd prakaram surrounds the roofed 2nd prakaram which houses the pantheon of deities associated with Shiva, which in turn surrounds the shrine of Annamalaiyar. In the meanwhile, preparations go on for the afternoon’s climax. Four of the five decorated Pancha Murthys are are brought out from the main shrine of the temple and housed in Vimanams in the 3rd prakaram of the temple, facing the flag staff and the Annamalai Hill. The last to arrive is Annamalaiyar who comes out of the second prakaram, dancing with his consort. Tiruvannamali (located in the erstwhile North Arcot district of Tamilnadu) has several hotels and ashrams and it attracts visitors from all over the world Ramanashramam and Seshadri Swami ashram being examples. Each occurrence of a full moon attracts hundreds of thousands of pilgrims. The Kartikai Deepam celebration also attracts lakhs (hundreds of thousands) to the extent that all incoming traffic is halted at the boundary of the town on the day of the festival. The government of Tamilnadu runs special bus and train services during the occasion. By car, it is a four to five hour drive from Chennai, and there are several 'point to point' non-stop bus services. 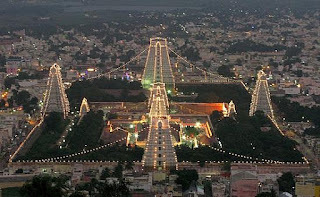 Tiruvannamalai is located on the railway line linking Villuppuram and Katpadi, and is therefore connected conveniently by rail to centers such as Tirupati and Thanjavur. Tirukkoilur with the Trivikrama temple and the Veeratteswarar temple, Saathanur Dam, and Vellore with its Jalakanteswarar Fort Temple are some of the nearby attractions.